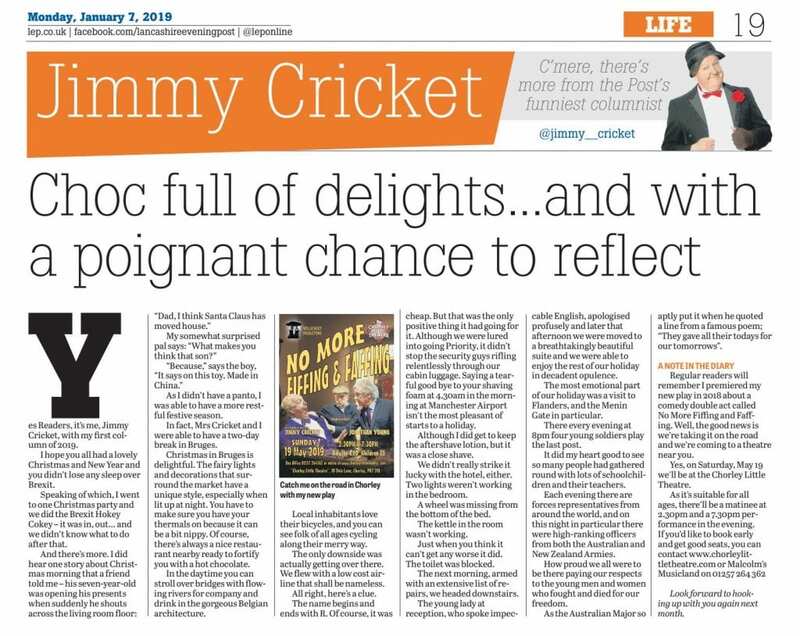 Jimmy Cricket has been telling Lancashire Evening Post readers about his eventful festive trip to Bruges and giving them an update on his new play, No More Fiffing and Faffing. The popular Northern Irish comedian’s first LEP newspaper column of 2019 was published on 7 January. He wrote: “I hope you all had a lovely Christmas and New Year and you didn’t lose any sleep over Brexit. Speaking of which, I went to one Christmas party and we did the Brexit Hokey Cokey – it was in, out… and we didn’t know what to do after that. As I didn’t have a panto, I was able to have a more restful festive season. In fact, Mrs Cricket and I were able to have a two-day break in Bruges. Christmas in Bruges is delightful. The fairy lights and decorations that surround the market have a unique style, especially when lit up at night. You have to make sure you have your thermals on because it can be a bit nippy. Of course, there’s always a nice restaurant nearby ready to fortify you with a hot chocolate. In the daytime you can stroll over bridges with flowing rivers for company and drink in the gorgeous Belgian architecture. Local inhabitants love their bicycles, and you can see folk of all ages cycling along their merry way. The only downside was actually getting over there. We flew with a low cost airline that shall be nameless. All right, here’s a clue. The name begins and ends with R. Of course, it was cheap. But that was the only positive thing it had going for it. Although we were lured into going Priority, it didn’t stop the security guys rifling relentlessly through our cabin luggage. Saying a tearful goodbye to your shaving foam at 4.30am in the morning at Manchester Airport isn’t the most pleasant of starts to a holiday. Although I did get to keep the aftershave lotion, but it was a close shave. We didn’t really strike it lucky with the hotel, either. Two lights weren’t working in the bedroom. A wheel was missing from the bottom of the bed. The kettle in the room wasn’t working. Just when you think it can’t get any worse it did. The toilet was blocked. Find out more about Jimmy’s play, which will be performed at The Met in Bury (23 February), Chorley Theatre (19 May), the Bridlington Spa (18 July) and the Gladstone Theatre on The Wirral.